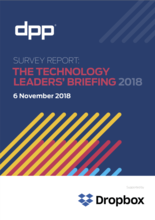 Enabled by Dropbox, the Digital Production Partnership’s Technology Leaders’ Briefing Report 2018 features 17 major technology customers – broadcasters, platforms and technology giants, providing focused, actionable business intelligence. Their top 3 priorities and the emerging trends are summarised in this report. The results of the first ever survey of how Production works - REVEALED!